There’s no right and wrong manual for parenting. But most parents want to be there for their child, no matter what. Some end up going a little overboard when it comes to protecting and providing for their kids. 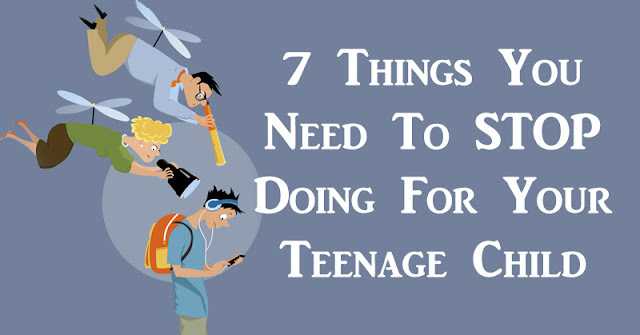 When your children enter their teen years, there are certain things they should be able to do on their own. If you don’t step back and allow them to learn, you’ll end up with a child who isn’t confident enough to do anything on their own. These might be fond memories for you – making your child breakfast and packing their lunch for school. But when your kid reaches his teenage years, it’s time for them to take over. Make sure there’s healthy food in the house your child can eat and take for lunch, but make sure you’re not the one doing the packing. If your teen suddenly panics in the car because they forgot their practice uniform at home, resist the urge to turn the car around. Were they playing around on their cell phone all morning? Did they wake up late? Use the opportunity to teach your child about consequences. If you are still waking your teenager up in the morning, it’s time to teach them about the magic of an alarm clock. Making sure that your teen gets up on time each morning isn’t exactly preparing them for the years to come. They need to be responsible enough to wake up when they need to each morning. Many parents sit down with good intentions to help their children with their homework, but an hour later their teen is nowhere to be found and the parent has finished the homework. If they ask for help, there’s nothing wrong with talking them through their work and helping them understand it. But don’t do it for them. Has your child ever had a momentary freak out because you didn’t wash something they wanted to wear to school? That’s the perfect opportunity to hand the responsibility of their laundry over to them. Teaching them how to do laundry is a simple way to help prepare them for when they leave home. Resist the urge to be an over involved parent. Teach your child that if something is important enough to him, then he needs to learn how to handle the issue himself, or at least ask for help. If there’s an issue between your child and his teacher or coach, let them try to figure it out before calling or e-mailing the school to get involved. If your child has a habit of leaving paperwork out for you to fill out, it’s time to take a stand. If it needs your signature, sure. But if it’s something your child is capable of filling out, let them do it. They’ll need to fill out job applications and college applications sometime in the near future.